Pre-baking: Cut out your cookie dough with an egg shaped cookie cutter, placing the eggs upside down (with the wider part on top) on parchment lined baking sheets. 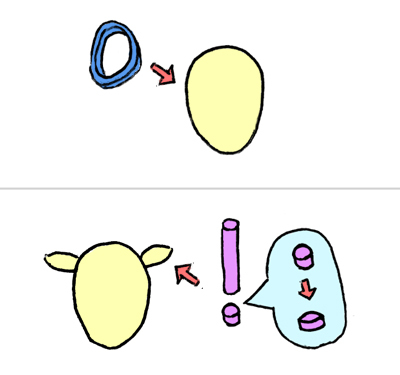 To make the cutter for the ears, snip a bit of the end off a pearl milk tea straw. Firmly pinch the straw so it makes a shape that looks like an eye. Use this eye shape to cut out ears from your dough scraps, gently pushing the dough out of the straw with a chopstick. Take a pair of ears, position them where you want them, and tuck a bit of the pointed edge of each ear under the head, gently pressing down so the ears stay in place. 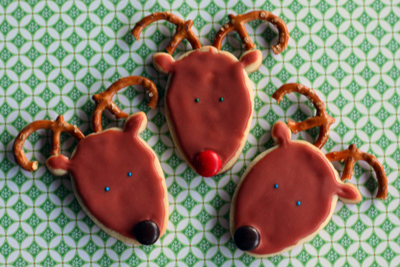 Next, to make the antlers, break your pretzels as show above. 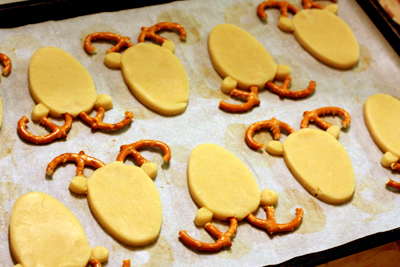 It might take some practice to break the pretzels, but keep at it; it gets easier after you get a few right. I ended up with lots of shattered pretzels before I got all my antlers. Once you have enough, take a pair, stick one end of each antler into the cookie dough at the middle edge of the top of the head. Now bake your cookies as indicated in the recipe. Then let them cool. 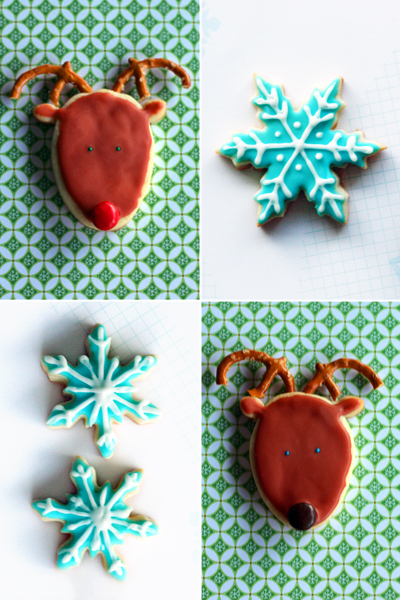 Post-Baking: Once your cookies are cool, they can be iced. Make your icing and tint it brown. 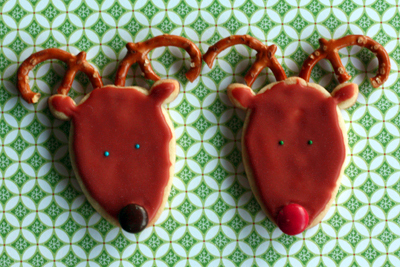 Spoon some of your icing on a reindeer head and spread it out with a spoon so it covers the entire face and both ears. Next stick a red or brown M&M (with the "M" downwards of course) into the icing at the bottom of the face. 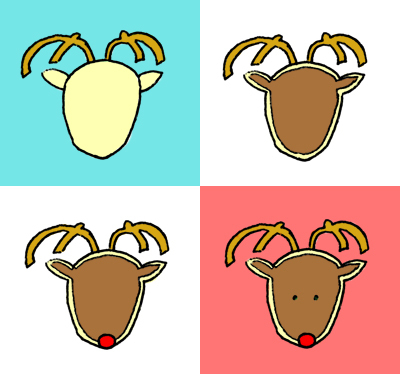 Then in the center of the face, place two green or blue sprinkles for eyes. 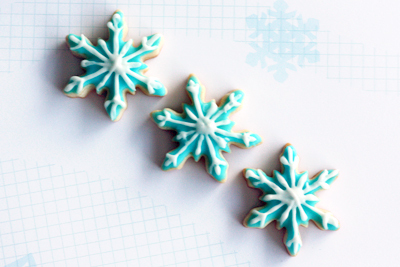 Use a snowflake cookie cutter to cut out your cookies. Bake them and let them cool. Once cool, make your icing. Set aside a third of the non-tinted icing (white). Tint the rest of the icing light blue. 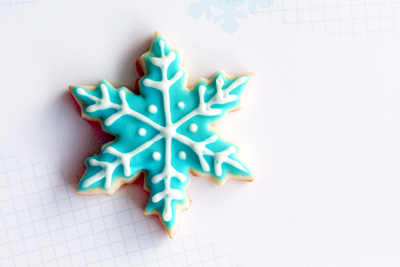 Spoon the blue icing onto the cookie and spread it out with your spoon, covering the surface of the snowflake. 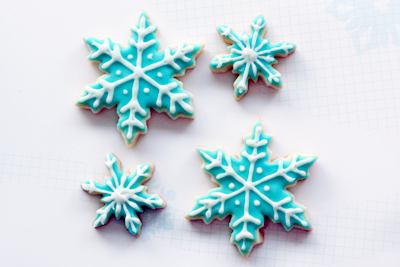 Place the white icing in a piping bag and use it to draw out white outlines on your blue cookies. Those look so yummy and great instructions. Happy New Year. 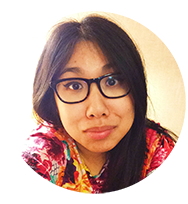 Jeanette: Thanks! Happy New Year to you too! You know this is like the absolute perfect post. Absolutely stunning and well informing. Love it! Dawn: I'm glad to know my instructions are helpful! Thanks for the comment. wine production: I'm glad you enjoyed this! Surviving the rain in beautiful: Haha, only 2-ish months till Christmas! I can't wait as well. I love baking Christmas cookies. P: Sorry for the late reply. 1) The egg cutter was part of a huge assorted set of plastic cookie cutter. The snowflakes were part of a 3-snowflake set that I got off Amazon. If you're thinking about buying cookie cutters, I suggest plastic ones because metal ones can bend out of shape and rust :(. 2) If the frosting has peaks, add a bit more milk or corn syrup to get it more liquid-y. After making the icing a couple of times, it'll become easier to figure out the perfect consistency.